Hey all, welcome to a new edition of Season Sim. In this series, I have BracketBot randomly generate results for the rest of this season based on the teams’ current ratings, and I show you what happens. I’ve actually made some changes to how these sims are performed, that I think will be more realistic. Previously, the current state of the rankings was holding far too much weight in how teams were evaluated, as the “true rating” of each team would stay constant regardless of what happened in the simulated games. Now I’m allowing that to fluctuate a bit. Maybe Duke and Virginia aren’t quite as good as I think. Maybe they’re better! SCENARIO: we’ve all just watched Virginia knock off Michigan State to win the title, 69-61. It was a nervous weekend for those who were rooting for the Big Ten to end its championship drought, but Virginia took down surprise Final Four team Wisconsin along with the Spartans to win it all. MSU had beaten Duke to get there, so it was an even mix of Big Ten and ACC. ACC: It was actually a tough end to the regular season for Virginia. They have this stretch of games coming up soon in their schedule: vs. Duke, @ UNC, vs. Notre Dame, @ Virginia Tech, @ Louisville. That’s four killer matchups in a span of five games (sorry, Notre Dame fans), and in this sim they lose all four. 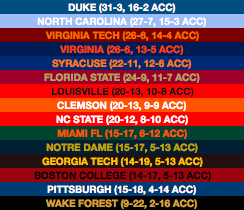 Winning their other games, including the rematch with Louisville, lets them finish 13-5 in the ACC, but that’s only good enough for fourth this time. Duke, UNC and Virginia Tech all surpass that. Duke, for their part, only loses once the rest of the way, and it’s the home matchup with Carolina. They too get some revenge in the last game of the season, winning in Chapel Hill to clinch the ACC regular season crown, and they double it up by crushing the Tar Heels in the ACC tournament. Duke and UNC are both highly-regarded enough to get #1 seeds, and despite the slump, Virginia at 26-6 gets a #2. 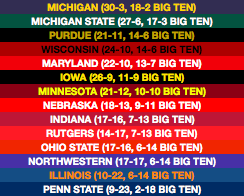 Big Ten: Michigan State, too, doesn’t win their conference regular season. That honor goes to Michigan, who splits their matchups with the Spartans and otherwise wins out through the regular season. The difference, then, is MSU’s loss at Wisconsin on February 12, a place Michigan has already lost IRL. Misleading down at the bottom is Nebraska – 9-11 is actually a decent recovery for them, with the Huskers currently sitting 3-7 in conference play. That 9-11 mark includes a sweep over Purdue and wins over other tournament teams like Maryland, Iowa and Wisconsin, so they actually get into the tournament easily. 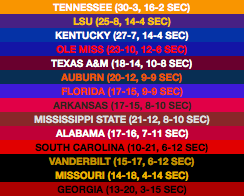 SEC: Tennessee is ranked #1 from now all the way to almost the end of February, as they come close to being able to run the table through a pretty tough SEC. Back-to-back losses to Ole Miss and Kentucky make them drop from their perch, but they actually regain the #1 ranking going into the tournament after avenging both losses on the way to an SEC tournament title. (They aren’t the #1 seed overall, that going to Duke, but they would be ranked #1 in the polls.) Auburn has a really tough season’s end, finishing 9-9 and just barely making the NCAA tournament, but you’ll see down below that it works out for them in the end. Big XII: One of the reasons I love Season Sim is the ability to see all sorts of different ways that Kansas’ Big XII championships streak could be broken. This time it’s emphatic, the Jayhawks coming in sixth place in the conference at 9-9. A four-game losing streak did them in, which included their annual tradition of losing to Oklahoma State. Kansas actually got to play spoiler in this sim, when beating Baylor in the final game meant that Baylor lost out on a share of the conference title, which was instead won alone by Texas Tech. Big East: It’s a back-and-forth season for Villanova. Here on January 30, they’re 7-0 and leading the Big East. That 7-0 becomes 7-3, with painful losses to DePaul and Georgetown coming up. But, that 7-3 becomes 15-3, and they win the conference by two games. They’re cited as one of the teams to watch in conference tournament week, to see if their hot streak continues, but the Big East tournament is a chaotic one. The bottom two teams, Seton Hall and Xavier, both advance to the semifinals after beating Villanova and Marquette respectively. Seton Hall nearly pulls out a miracle tournament run, but they’re stopped in the final. 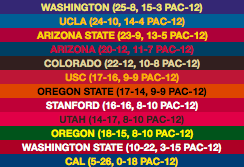 Pac-12: The surprise of the Pac-12 season is the surge of UCLA under interim coach Murry Bartow. A surprise win snapping Washington’s unbeaten run gets everyone’s attention, and closing conference play on an eight-game win streak (from 6-4 to 14-4) makes them actually look like a tournament team. And they especially look like a tournament team when they take down Colorado to win the Pac-12’s automatic bid. 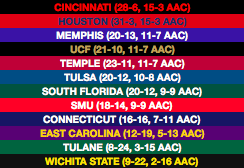 AAC: The AAC, of these seven conferences, is the one that most goes according to plan. Cincinnati and Houston run away with things, splitting their two games between them and only losing one other game each en route to a shared conference title. UCF is also a tournament team in this instance. Chaos in the A-10, as it miraculously becomes a 3-bid conference this season. A three-team conference race sees VCU and Davidson both squeak in with at-large bids to the tournament, and Saint Louis doesn’t miss by much either, picking up a 2-seed in the NIT. The third bid goes to unheralded St. Joe’s, who enter the conference tournament with a 14-17 record, 7-11 in conference, and seeded #11 (finishing last in the tiebreaker among five 7-11 teams). They then proceed to win five games in five days, including VCU in the quarterfinal and Davidson in the final, to make the tournament. Other at-large bids go to Buffalo (Toledo wins the MAC autobid, although they probably would have gotten in anyway), San Francisco, and Utah State. And there’s a 16-over-1 upset again! It’s not a good one for fans of mid-major schools looking for tournament respectability. Gonzaga had gone undefeated in the WCC and won that tournament fairly handily, only getting scares from USF, but immediately fall flat on their faces in getting beaten by the Colgate Raiders. Colgate finished fifth in the Patriot League but beat Lehigh to make the dance. As I’ve mentioned before, games in these simulations have their results decided in part by picking a random number from 0 to 9999. Colgate needed 9889 or higher to win this simulated game, with 0-9888 being the Zags’ territory. 9963 came up, which corresponded to an 87-82 Colgate win. Other weird stuff here: At 20-12, Auburn has a tough Selection Sunday, feeling fairly confident that they get in but not sure. Despite their rough SEC season, there’s still a good team hiding in there, and they prove it by beating both Creighton and Kansas to make the Sweet 16. Hardly any other upsets in this bracket, including basically none on the entire left side, but Wisconsin’s win over Kentucky in the second round qualifies. Alright guys, I hope you enjoyed this edition of Season Sim! There will be another one on Sunday, along with BracketBot updates on Friday and Sunday. Catch you then!